Like it or not, there are certain fixtures of our past that aren't ever coming back. Like... telephone boxes. And Britpop music; essential episodes of The Simpsons; people saying "psyche"; sensibly priced train tickets, and the unbastardised version of the word 'literally'. The list is enormous, and a couple of years ago there was something else that belonged on it: virtual reality. Remember virtual reality from the '90s? Those neck-compressing helmets that weighed more than a small child; those obnoxious pods you had to stand in like a bully-magnet; those woeful purpose-built games that, unlike what you had fantasised, were nothing like being in The Lawnmower Man. Despite a push from manufacturers, virtual reality sank as fast as it soared. As you can imagine, one of the key reasons why it struggled to gain traction was the concept itself, which was a tad intimidating to the average consumer. On top of this, the hardware was prohibitively expensive (even for arcades, which incidentally also belong on the list above). But the key reason why virtual reality collapsed in the early '90s is the same as with most failed game inventions – people weren't having much fun. A couple of decades later, and virtual reality is perhaps the most exciting prospect in core gaming. This revival began as recently as August 2012, when the Californian start-up Oculus VR pitched its PC head-mounted display on Kickstarter, surpassing its $250,000 funding target in less than 24 hours, and going on to raise a cool $2.4 million. Things have progressed at a remarkable pace since then. As a growing number of opinion-formers and consumers testify to the immense joy of using Oculus Rift, the business has raised close to $100 million in venture capital funding. Last year it hired the pioneering programmer John Carmack as its chief technical officer, and this year the company is preparing to put the peripheral on general sale. Some still doubt its potential, and I can understand why to an extent. The Oculus Rift carries the same problems as the old VR machines from the '90s. Its price point makes it an unequivocal luxury, especially for a peripheral, and the concept itself will probably scare off mums and dads. But there's one crucial difference this time: When people try Oculus Rift for themselves, the idea sings to them. It is a dazzling, heavenly, literally (sorry) unforgettable piece of technology. It gets better. Last week, at Valve's Steam Dev Days event in Washington, the PC games giant pledged its commitment to Oculus Rift. Valve, which tries to act as an 'enabler' in the PC space, said it wants to "drive VR forward", which likely means it wants a whole library of games to support the device. 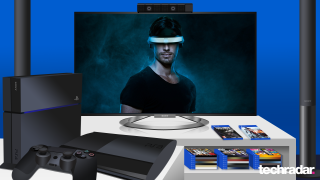 "At some stage this year, Sony will release a VR headset for the PlayStation 4"
If you're more of a console gamer, however, there haven't been nearly as many interesting things going on. Yes, yes, new games systems are always exciting on a fundamental level, yet both the Xbox One and PlayStation 4 have a stench of inevitability to them. Though myself and TechRadar's new Xbox Gamer columnist, Aoife, may have different things to discuss, in truth there's no meaningful difference between either console. One comes with a camera as standard, the other doesn't. That's about it. Which is why it's a relief to know that, at some stage this year, Sony will make significant strides to stand out from the crowd. From what I've been told by people familiar with the matter, Sony is preparing to reveal its own VR headset, custom built for PlayStation 4. It was initially going to be announced at Gamescom in August, but for reasons unknown was pulled at the last minute. Despite the silence, behind the scenes there appears to be a lot going on. Key first-party games like DriveClub are already being tested with the head-mounted display, which apparently could also work with the PS4's add-on camera to facilitate head-tracking. In the race to build the most appealing core games console, both Microsoft and Sony have decided to put innovation to one side. To be fair, thinking outside the box hasn't done Nintendo any favors recently, and playing it safe has helped Xbox One and PS4 shift the kind numbers that Oculus VR can only dream about. But history tells us that games were born through innovation, sold as gimmicks, and eventually accepted as an interesting and unique form of entertainment. Games are driven by invention and bold thinking, and if there's one thing from our past that needs to stay, it's that.